(CBS News) An electronic billboard in Caldwell, Idaho, that compares President Obama to Aurora, Colo., movie theater shooter James Holmes is drawing sharp criticism from Americans nationwide. Displaying side-by-side images of Holmes - the suspected shooter who killed 12 and wounded 58 others by firing weapons inside a packed midnight showing of "The Dark Knight Rises" - and the president, the billboard says of Holmes: "Kills 12 in a movie theater with assault rifle, everyone freaks out." 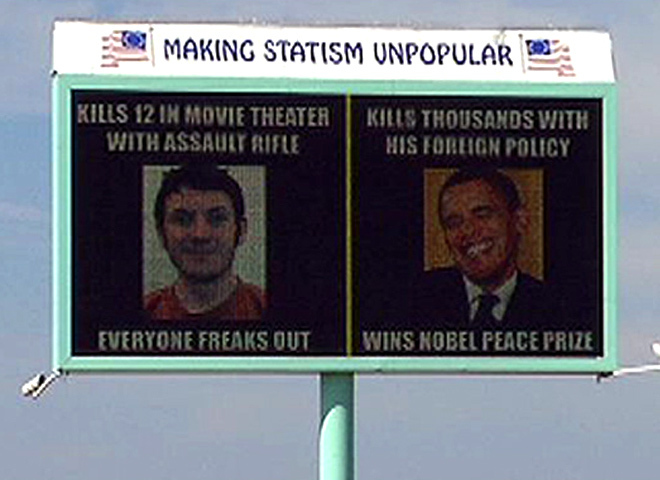 Of Mr. Obama, it says: "Kills thousands with foreign policy, wins Nobel Peace Prize." "Repulsive," "disgusting," and "bypassing tasteless," are just some opinions of the billboard left in the comments section of local news reports. Maurice Clements, a spokesman for the Ralph Smeed Foundation - the ultra-libertarian group that owns the billboard boasting the slogan, "Making Statism Unpopular" - admitted to the Idaho Statesman that the provocative content is "a technique of trying to make a point, and maybe it was poorly done." Still, Clements stood by the billboard's message, which was that Americans are "all outraged over that killing in Aurora, Colo., but we're not outraged over the boys killed in Afghanistan." "We're not saying that Obama is a lunatic," Clements added. Not everyone who weighed in online was against the ad - some backed the group's right to free speech, and some supported the sentiment. One commenter wrote there is "zero wrong with the board."